Neebe performs widely as a soloist across the Eastern United States and throughout Europe, where he has appeared with the Goethe Institute Cultural Program in Rothenburg ob der Tauber, Germany, as well as in Norway and Slovakia. He currently serves as principal trumpet of the Roanoke Symphony Orchestra and the Wintergreen Festival Orchestra and is the trumpet mentor of the National Music Festival in Chestertown, Maryland. Neebe has been praised for his commitment to the commissioning and recording of contemporary American works for the trumpet. Neebe’s CD Te Deum (MDG 2003) includes the first of his commissions from American Composer Roger Petrich, Prayer and Epilogue, a work for trumpet and organ, premiered and recorded in Germany. 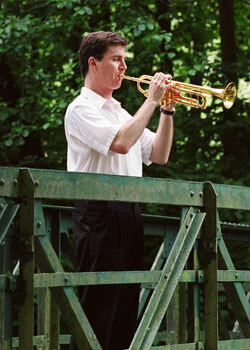 His CD American Trumpet Concertos (Albany Records 2005) with the Slovak Radio Symphony Orchestra consists of all world premieres of trumpet with orchestra compositions. For his newest CD, 21st Century American Trumpet Concertos (Albany Records 2014) with the State Philharmonic Orchestra Kosice, Neebe commissioned, recorded and premiered each of the compositions. Paul Neebe holds both the Bachelor and Master of Music degrees from the Juilliard School as well as a Doctor of Musical Arts degree from the Catholic University of America. He has taught at the University of Virginia, James Madison University, Elon University and the Summer University in Bayreuth, Germany. His teachers have included Bernard Adelstein, Barbara Butler, John Harding, Steve Hendrickson, Arnold Jacobs, Doug Myers, Vincent Penzarella and William Vacchiano.